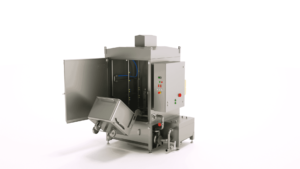 Industrial Washing Machines (IWM) has launched a new and improved line of industrial bin washers suitable for washing 200 and 300 L Eurobins. The EC20 comes complete with integral automatic bin lifting devices and offers exceptional wash performance to both internal and external surfaces of the widely used wheeled buggy. Crucially, the latest EC20 machines come equipped with the motorised and unique IWM “TravelJet” traversing jet wash system that delivers 100% of the high power pumped jetting 360° around the soiled buggies within the wash compartment. The travelling jet system ensures there are no dead spots when cleaning, including the troublesome lip and wheel areas. The TravelJet system incorporates corrosion-proof plastic bayonet-type or stainless steel jet nozzles. The EC20 with TravelJet is ideal for Eurobins as well as Vemag skips and stainless steel or plastic buggies; and where applicable, the EC20-30 model accommodates both 200 litre and 300 litre bins without the need for any operator adjustments. The EC20 works by fully inverting the bin and washing the insides with a high velocity rotating spray manifold, while the outside is washed simultaneously with a full surround jetting system. Typically a powerful stainless steel 11 kW pump is fitted to the machine to ensure that all of the washing actions are both vigorous and thorough. The new machines are equipped with a flexible control system that provides a high level of automation and allows the wash cycle to be optimally matched to the user’s requirements. Running costs and environmental impact are minimised by re-circulating the wash water from a heated tank via an efficient rotary filtration system can be fitted as an option that reduces the need for water changes. The EC20 industrial bin washers are configured for a cold rinse, using a solenoid-controlled supply of fresh water from the mains as standard, but options for hot and/or chemically assisted rinsing are also available. EC20 bin washers are constructed from stainless steel throughout to ensure long life, and they feature a robust streamlined design that is not only hygienic, but also allows easy access to all areas for cleaning and maintenance. If you enjoyed reading this article you may also like to read our previous post on pallet washing.